people often ask me where i find all these places that i travel to. obviously i spend a lot of time online researching destinations for work and reading my favorite travel blogs. but i also try to make time for inspiring magazines such as CEREAL and MONOCLE, which always have the best tips. last but not least, every once in a while, there will be a guide or a book that catches my eye in the store. even before i open the cover, i know that it will make me dream of booking a flight and escaping to a wonderful place. 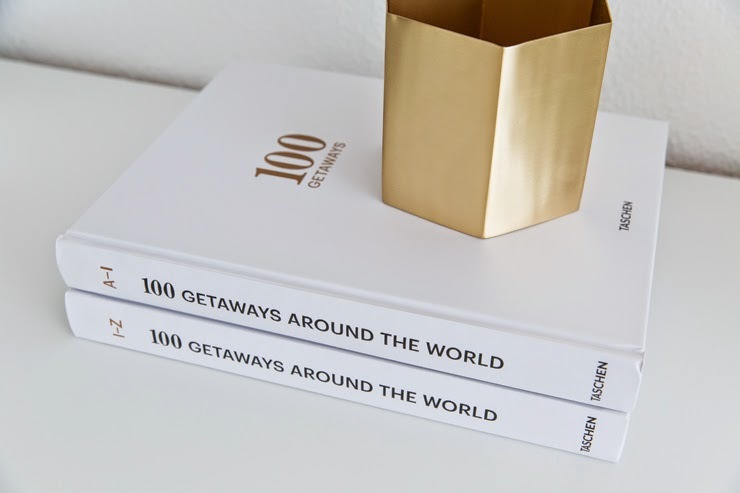 taschen’s 100 GETAWAYS is such a title. lately i’ve been finding myself in the mood for a different kind of travel experience. i still get super excited thinking about the city trips on my schedule, but after years of flying around europe and driving across the states, from one cool city to the next, i feel like i’m ready to finally book a trip that entails nothing but lying back and relaxing. so when taschen was kind enough to send me the 100 getaways tome, i sat on the couch for hours leafing through the two books, imagining where i would go if i could go anywhere in the world. ultimately, i decided on this gorgeous resort in the heart of norway, called JUVET. it has everything i’d need to deconnect from the real world and enjoy some quiet time – breathtaking views and a divine spa, modern architecture and impeccable style. i can easily imagine myself spending a few days there, catching my breath after a busy period or refueling before tackling the upcoming projects in my life. but then again, i can’t even imagine traveling all the way to norway and then not tacking on a few days in oslo as well. hey, it’s about finding your balance, right?